I'm trying to install the new Roxio NXT 3 Pro version and one of the first steps is to uninstall the previous version first. But it seems like it's stalled on it and hasn't moved in more than 45 minutes. See attached. What should I do? Cancel the setup and try again or just let it go? If I cancel it it might not uninstall the previous version and I will need to uninstall it manually. Are there procedures to do that? I had that same issue as did another person I knew. Both he and I used the three finger salute to force a shutdown of the computer. NXT 3 then installed and ran properly. I think the hang is actually between the final uninstall of the previous version and the start of the install of the NXT3. I still have some folders from previous versions but they really don't take up all that much room and don;t seem to interfere. Some people like to uninstall programs using Revo Uninstaller in the Moderate mode. I suggest that if you decide to do that, you download the trial of Revo Uninstaller Pro and use the forced uninstall in the moderate mode (only). If you just use standard Uninstaller and not the Pro and not the forced Uninstall, you may not even see the previous version. What is the previous version you are trying to uninstall -- it might help Roxio create a fix. The previous version is Roxio NXT 2 Pro. I found this site in Roxio. It helped me to uninstall properly and clean up things. 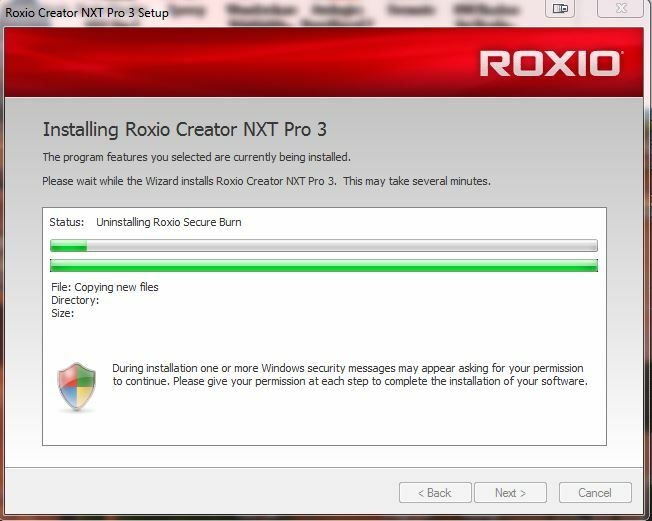 So right now, I'm trying to install Roxio NXT 3 Pro. I was able to finally install Roxio NXT 3 Pro. Download and install the Creator 2011 System Cleaner here. After downloading, unzip the C2011_CleanSystem.bat file to the folder where the installer files are extracted to in Step 2. It should be in the same folder as the Creator 2011 setup.exe file." ??? I too am having great difficulty installing NXT3 (not the Pro version, however). First I performed a complete system image backup with Maxrium Reflect for insurance purposes. I am glad I did. I then attempted to uninstall NXT2 using Revo Uninstaller Pro and the process hangs when trying to uninstall Roxio Burn. What it did do is make NXT2 unusable. To get back to a known working state, I restored the image backup. I then attempted to install NXT3 and let it uninstall NXT2. The result was the same as Shawn B. See screenshot. Again the only way to get back to a working NXT2 was to do restore the image backup. This seems ridiculous that Roxio cannot provide a robust uninstaller. Any suggestions other than using the System Cleaner? Did you try the uninstaller the poster said worked above? I would disable Roxio Burn. Download and install the Creator 2011 System Cleaner here. I did not try the System Cleaner. Although it appears others have used it with success, I am leery of it. I don't understand how a program that is placed in the folder with the NXT2 Installation folders/files can remove the Installed files. I am working with a download version of both NXT2 and NXT3. I have no idea where NXT2 placed the Installation files. Yes, I know I can re-extract the Installation files to a new location and then run the cleaner, but what sense does that make? Maybe I'm just overly cautious, but I am not anxious to restore my system from an image again. Since I am within the 14 day warranty window, I am opening a ticket with Tech Support. We'll see what they come up with. 1. I would find where the download version of both NXT2 and NXT3 are burn them to disc and back them up to another hard drive before trying the KB Article. Keep us informed what support tells you to do? I did not try the System Cleaner. Although it appears others have used it with success, I am leery of it. I don't understand how a program that is placed in the folder with the NXT2 Installation folders/files can remove the Installed files. It's quite simple. The system cleaner program is just a batch file which says "setup.exe CleanSystem=1"
This runs the installer [setup.exe] with a flag to make it run in reverse. As CD says if you have any trouble using the Windows uninstall, use the system cleaner batch file. I've tried it, and it worked well. CD - Thanks for the advice...both versions are backed up on three hard drives via SugarSync! Brendon - Thanks for the explanation of the system cleaner program. I now feel better about using it, but I think I will wait to see what Tech Support has to say. System Cleaner and the uninstall hung at the same point. I have requested a refund for NXT3 from Roxio/Corel. Roxio Tech Support remoted in to my PC and went through the NXT2 uninstall process. It turns out that the uninstaller did not terminate the RoxioBurnLauncher.ese process and the process had to be ended manually through Task Manager. No explanation as to why the uninstaller failed to terminate the process, but after it was terminated manually, the uninstall continued normally and then I was able to install NXT3. Another piece of trivia to file away in the memory banks. Does NXT3 show no disk in your drive too? Yes, unfortunately NXT3 did not resolve the "no disk in drive" problem. Informed Roxio Tech Support of this issue again. I continue to work around it by using my external DVD drive or burning to an ISO file.